Rimmel London have many type of foundations like wake me up, True match, lasting finish and stay matte with wide range of shades. All these foundations serves different type of skins and solutions. 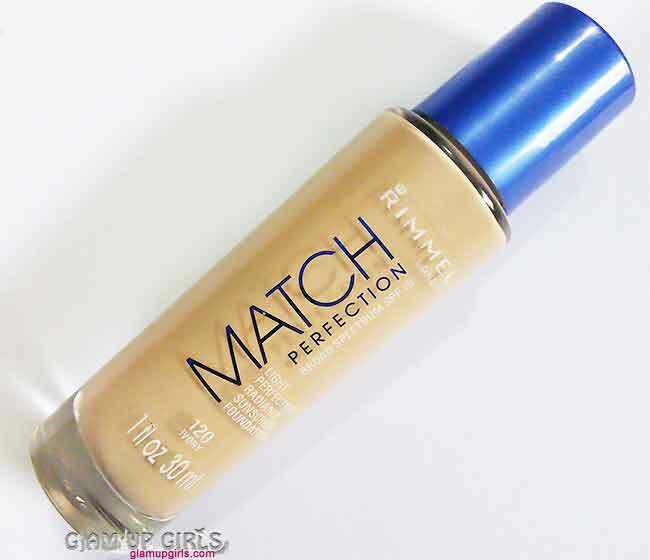 As i have dry skin after reading some reviews i came to know that Rimmel Match perfection is best for dry to combination skin. I have been using this foundation for some time and today i will be sharing my thoughts with you. This foundation comes in glass jar with blue cap. The one i got is without pump but if you want it with dispenser pump make sure to confirm it before buying. The texture of this foundation is creamy on thin side which is easily blend able and is very light weight. It has a very refreshing and noticeable fragrance which i loved about it but if you have sensitive nose and like your foundations to be scent free then this is not for you. The best thing about it, it comes with built in sunscreen which is must nowadays. The formula is more on wet side and takes time to dry before you apply your other makeup and still leaves the dewy finish. So it is not at all for oily skin types and if you like matte finish don't try this one. I would suggest you use any brush for this foundation instead of beauty blender, specially if you use wet blender. I apply this foundation with Real Technique expert brush which is so far the best one for it. It gives the medium coverage but is build able and doesn't look cakey or patchy. The one thing which is really impressive that it does provide natural coverage and feel very light on the skin. The lasting power is however not up to the point and only after 2 hours you will notice it disappearing which is a big con if you want some thing to last at least 5 to 6 hours. With Rimmel Stay matte Powder will add an extra time to its lasting power but then there will be no dewy look. With setting powder it will last to 4 to 5 hours. I would say it is perfect for winters but in hot and humid summers you will not like it much. Overall this foundation is good for dry or combination skin which is more towards dry. It gives natural, light weight coverage with dewy finish.